Published: June 4, 2013 at 12:56 a.m. Updated: June 4, 2013 at 02:31 p.m.
David "Deacon" Jones, the Hall of Fame defensive end whom some consider the greatest defensive player in NFL history, died Monday at the age of 74. The Washington Redskins, for whom Jones played his final NFL season in 1974, posted an obituary on their website Monday night after announcing the news. Jones died of natural causes in his Anaheim Hills, Calif., home, the Los Angeles Times reported. Jones' stepson, Greg Pinto, told the Times that his stepfather was sick for some time, so his death wasn't unexpected. Jones was at home with his family at his bedside when he died Monday night. 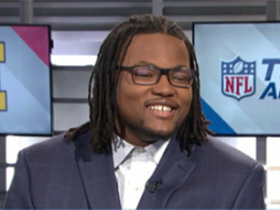 NFL Commissioner Roger Goodell issued the following statement about Jones on Tuesday: "He was an icon among the icons. Even with his fellow Hall of Famers, Deacon Jones held a special status. He was a hard-charging football player and the original sack artist who coined the term. 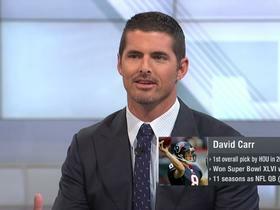 He is warmly regarded by his peers not only as one of the greatest players in NFL history but also for his tremendous influence and sense of humor. Deacon Jones will be missed but always remembered. Our heartfelt condolences go out to his wife Elizabeth and the entire Jones family." Jones' NFL career started in 1961, when he was selected in the 14th round (186th overall) by the Los Angeles Rams out of Mississippi Vocational (now known as Mississippi Valley State). Jones spent his first 11 seasons in Los Angeles, where he teamed with Merlin Olsen, Rosey Grier and Lamar Lundy to form "The Fearsome Foursome" -- one of the most famous defensive lines in NFL history. Jones was selected to seven consecutive Pro Bowls with the Rams from 1964 to 1970 and made eight overall. Olsen died in March 2010 at age 69, and Lundy died in February 2007 at 71. Grier, who is 80, is the only surviving member of "The Fearsome Foursome." The Rams also released a statement about Jones on Tuesday. "Deacon Jones was one of the rare players who changed the way the game was played," said Kevin Demoff, the Rams' COO and executive vice president of football operations. 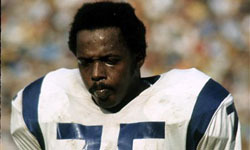 "In this day and age, the term 'great' is often overused, but it only begins to describe Deacon Jones as a player and person. His combination of God-given talent and relentless effort made him one of the greatest players to ever put on an NFL uniform. His spirit, laughter and gentle nature off the field made him a friend to all. Deacon was a legend in every sense of the word, and he'll truly be missed by the Rams, our fans and the NFL community. Our prayers are with Deacon's wife Elizabeth on this sad day." Few would disagree with former Rams coach George Allen, who labeled Jones as the "greatest defensive end of modern football." Jones, also a two-time NFL Defensive Player of the Year, was nicknamed "Secretary of Defense" by Rams fans. Jones later was named "defensive end of the Century" by Sports Illustrated in 1999. Jones -- who proved to be one of the more durable players in NFL history, missing just five games during his decorated 14-year career -- was traded to the San Diego Chargers in 1972 and had immediate success, receiving defensive captain honors and a Pro Bowl selection. Jones finished his career in 1974 with the Redskins. In addition to his accomplishments on the field, the outspoken Jones is credited with coining the phrase "sacking the quarterback." Sacks weren't kept as an official NFL statistic until 1982. Had they been kept far earlier, few doubt Jones would have been among the NFL's all-time leaders. According to the Rams' media guide, Jones recorded a team-best 159.5 sacks with the franchise and 173.5 in his career. He recorded double-digit sacks seven times with the Rams and became the first defensive lineman to post 100 solo tackles in a season (1967). "The thing we've got to remember being players in this era is to really respect the game 'back when,' because those guys could really play," said Chris Long of the Rams, whose father, Howie, also is in the Hall of Fame. "Deacon Jones is a perfect example. 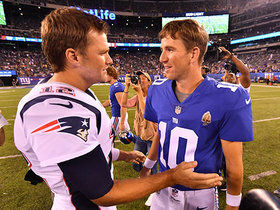 This whole league and everybody in this game should honor the past and the players who played in that era. Those guys paved the way for us." Take a look at the best photos showcasing the career of Hall of Fame defensive end Deacon Jones. Jones achieved success in the corporate world in the decades following his retirement, but the football accolades continued piling on. He was named to the NFL's 75th anniversary team in 1994 and voted the 15th greatest player in league history in a 2010 NFL Network special. Jones made several trips to visit troops in Iraq and was active in the community. He particularly enjoyed working with youngsters and youth organizations. His passion for helping shape young minds led him to start the Deacon Jones Foundation in 1997. He served as the foundation's president and CEO.